The question of whether to include a label and safety data sheet when shipping chemicals really hasn't changed under the new GHS rules, says the woman who led the revisions. At the American Industrial Hygiene Association's annual conference in early June, health and safety consultant Jennifer Silk said that GHS identification is usually warranted when there is one good study linking a substance to a health risk. A report on her speech by Bloomburg BNA states that employers should generally use the same threshold for determining whether to mark a hazardous material under the revised hazard communication standard as they would have under the previous rule. Silk advises employers to consider the purpose of the standard - to make sure people have the information they need to protect workers. Why do we continue to see reports of construction workers trapped in trenches? Workers may not know just how heavy dirt and other trenching spoils can be. A cubic yard of soil may weigh more than 2,700 pounds – as much as some cars. Suffocation is as great a hazard as the weight of the material. OSHA reports that excavation incidents have a fatality rate that’s 112 percent higher than general construction activities. Even more chilling is the fact that most trenching accidents can be prevented. Following some very basic safety procedures can minimize the possibility of a trench accident or reduce the amount of time and effort needed for a rescue. The Occupational Safety and Health Administration (OSHA) announced on June 10th the release of a new online, interactive game-based tool developed to help employers and employees identify workplace hazards. Assistant Secretary of Labor Dr. David Michaels discussed at the American Society of Safety Engineers conference in Orlando, Florida on the design and goals of the tool. 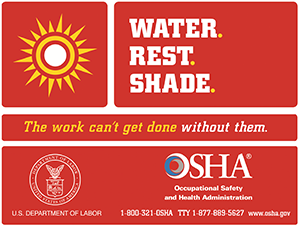 For the fourth consecutive year, OSHA's Campaign to Prevent Heat Illness in Outdoor Workers aims to raise awareness and educate workers and employers about the dangers of working in hot weather. It also provides resources and guidance to address these hazards. Workers at particular risk are those in outdoor industries, such as agriculture, construction, landscaping and transportation. "Heat-related illnesses can be fatal, and employers are responsible for keeping workers safe," said U.S. Secretary of Labor Thomas E. Perez. "Employers can take a few easy steps to save lives, including scheduling frequent water breaks, providing shade and allowing ample time to rest."